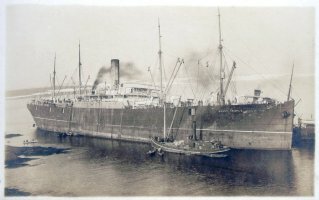 Originally part of the Elder, Dempster & Co. fleet, Mount Temple was built by Armstrong, Whitworth & Co., of Newcastle, and launched in June 1901. She made her maiden voyage, Tyne-New Orleans, on 19 September 1901. Apart from two Boer War trooping trips to Cape Town, Mount Temple remained on Elder, Dempster's New Orleans service until 1903. She was then acquired by Canadian Pacific, together with Elder, Dempster's Canadian service and 14 other ships. She retained her name, however, and after six Liverpool-Montréal roundtrips, was placed on the London-St. John, New Brunswick service. During the night of 14-15 April 1912, Mount Temple was in Titanic's vicinity when she struck a berg and sank, and was one of the first ships on the scene the morning after. Taken over as a troop carrier in September 1914, Mount Temple returned to commercial service the following year. On 6 December 1916, however, she was captured and sunk by the German raider Mowe 620 miles (990 km) off Fastnet. There were three fatalities. The remaining 108 on board were taken prisoner and interned. 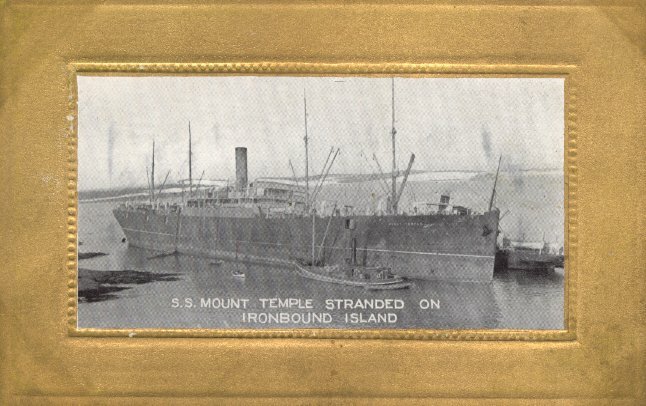 The photograph and postcard on this page shows Mount Temple aground, at West Ironbound Island, Nova Scotia, where she was stranded from 1 December 1907 until 16 April 1908. 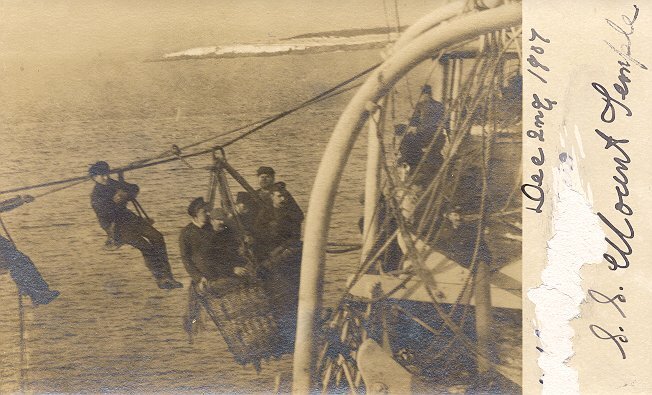 After a breeches buoy was put into place, the 600 people on board were put off and taken to Halifax. Sources: Bonsor's North Atlantic Seaway; Haws' Merchant Fleets; Williams' Wartime Disasters at Sea.